The versatile and talented football player who is widely known for his physical power, his perfect body build, and outstanding prowess, Philip Anthony Jones also known as Phil Jones has been nicknamed “Jack of all trade” for his mesmerizing display in the soccer field. The fascinating footballer functions as a defensive midfielder, plays at center back as well as right back. Although the center-back is often identified as his best position, the mesmerizer always fills in at right-back position. His stocky build poses a threat to the opposition who have found it almost impossible to out-smart or out-muscle him. According to Sir Alex Ferguson’s comment in 2013, Phil could arguably be United’s best ever player from the way he is looking. The Manchester United defender Phil Jones was born on the 21st day of February 1992 in Preston, England. Phil is the son of Helen Jones (mother) who works as a housekeeper and Mark Jones who worked at British Nuclear Fuels. He has a sister called Laura who is a dancer. The soccer star is of English nationality and White ethnicity. Phil’s father Mark is a raving football fan who tried his hands at the game but was not successful. Phil’s father supported the football club Blackburn Rovers in his formative years and could not wait for his on to grow up to start taking him along. According to Phil, his father’s love for the Blackburn Rovers made him support the club all his life. Phil’s educational background is traceable to St Paul’s Primary in Farington where he got his early education. While the budding star was in the primary school, he lived and breathed football, he went to the extent of creating artificial goalpost with his cardigan so as to be able to enjoy a soccer game, even when he left primary school to Balshaw’s CE High school in Leyland, he continued in the same vein and consequently played for the under-10 team of the Ribble Wanderers. Before the English professional footballer joined Manchester United, he played at both the youth and senior level of the Blackburn Rovers where he was featured as a center-back, but can also come in as a defensive midfielder or a right-back. To date, Phil Jones still plays for the English National Team and the popular Premier League club Manchester United. The soccer star is presently part of the English senior squad and has represented his country at various levels. In 2009, Phil was in the under-19 team but in 2010, he made his debut in the under-21 team. On the 7th day of October 2011, the mesmerizer played his first match for the England senior team. He will be joining the team for the 2018 FIFA World Cup. 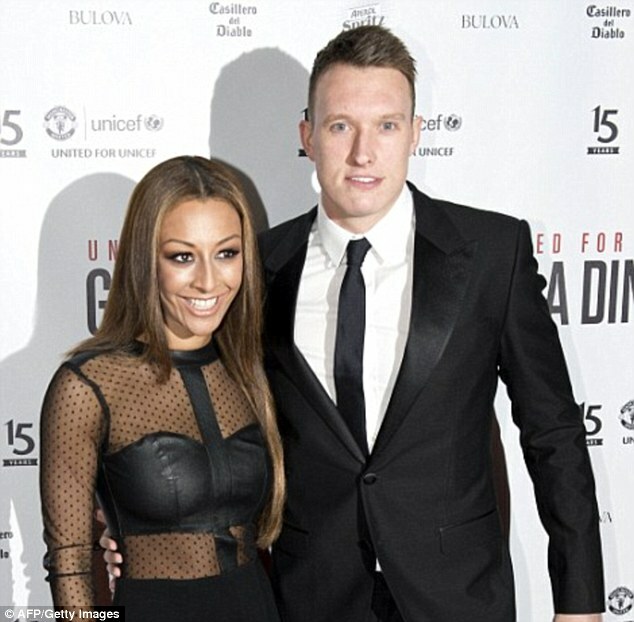 The soccer star is currently married, Phil Jones and his long-standing girlfriend, Kaya Hall tied the nuptials in a star-studded wedding which took place at their home church in Cheshire. Several notable Manchester United teammates which include Sam Johnstone, Chris Smalling, Luke Shaw, West Brom’s Jonny Evans, and Wayne Rooney were there to witness the marriage ceremony. Kaya was the center of attention as she looked alluring in her beautiful white gown while Phil was really good looking in his striking blue suit complete with a bow tie. The couple has been living in marital bliss since then and no rumors or controversy have been heard on their account which may be due to the fact that Kaya is as down to earth as her husband Phil. They met for the first time when Kayla was a student at the university and Phil was still at Blackburn. The announcement of their wedding was made on Christmas day through Twitter and for reasons that are yet to be explained, the couple immediately bought a guard dog to guard their home. The football star loves travelling a lot and has been on vacations several times with his spouse. Phil’s most preferred holiday destinations include India, Los Angeles, Sydney, New York and Dubai. So far, the wonderful couple seems to be living the proverbial storybook happily ever and from all indications, divorce or separation seem to be very far from them. Phil Jones stands at an admirable height of 6 feet I inch which is approximate to 1.85m and he has a weight of 71kg or 157 lbs to balance it off. The footballer’s other body statistics are not currently available to the public.